Did you know you’re living with thousands of things you don’t need? I didn’t realize it either until we decided to become full-time RVers. As I sorted through room after room of things I realized how much we had that was unnecessary. It wasn’t junk or hoarding-type stuff but it was stuff and it was overwhelming. There is a vast amount of things you don’t need in your life and it is time for them to go. As the years roll by, stuff starts to build up, even if you’re an organized and tidy person. Before you know it you’re finding that 1600 square foot house seems to have no more room in it and yet, you have no idea how you ended up with all this stuff. It’s time to take a look at the things you don’t need and rid yourself of them once and for all. I can tell you, when you’re tenting you realize quickly that only absolute necessities have a place in your space. The Lord seems to be refining our way of thinking when it comes to possessions. We are far from Colin Wright and his 51 possessions but we’re also a far cry from the average 300,000 items most families own. We’ll save the conversation of how many things you should own for another day but chances are, no matter where you live there are things cluttering up your life that need to go. So today we’re focusing on the things you don’t need that might not realize. This insight comes from losing most of our possessions in a house-fire, being full-time RVers, and an extended tenting experience. Trust me. There’s a whole lot you can live without. Excess Kitchen Gadgets – I know. I am a Pampered Chef junkie and I prepare all of my meals from scratch. This chick loves the kitchen. You really can prepare healthy, nourishing foods without every tool, appliance, and gadget on the market. After our fire and while tenting for over 2 months, we had limited kitchen tools and were still able to eat an 80% traditional foods from scratch diet. You can read about or small kitchen experience here. Mugs – Have I ever mentioned my love for coffee, tea, and this amazing hot cocoa? Mugs are a must in a coffee drinker’s home but too many cause clutter and waste precious kitchen cupboard space. I have six coffee mugs and we keep four travel mugs, one for each of us and a spare. Plus, if there’s a time when we won’t have running water or we’re going on a long trip I buy these for easy clean up. Extra Sheets – You do not need four or five extra sets of sheets for your bed. And unless your children are of potty training or bed wetting age, you don’t need four or five for them either. One extra set, stored flat between your mattress is all you need. Positive Opinions of Other People – Yes, this is a thing you don’t need. You see, when we care about and worry over what other people will think we burn mental and emotional energy we could use elsewhere (like loving our kids and spouse, and worshiping God.) If please people is an issue I’ve got some tips for not worrying what other people think. Clothing that Doesn’t Fit – We all have it – that outfit, swim suit, or favorite pair of pants we just know we’ll get into again one day. But how many years has it hung in your closet or been packed in a storage tub? There is a thrift store in just about every town. You can find more cute clothing when you do lose that weight but for now, part ways with it. It’s taking up space! Cable or Satellite – For three years I tried to get my husband to ditch satellite. $184 a month, $1840 a year, on television we only watched on Sundays and evenings in the winter seemed like such a waste of money. His hesitation, live sports. We both enjoy NASCAR and football and nothing offered us live sports…until recently. Now, with options like PlayStation Vue (no game player required), DirecTV NOW, and Sling, you can get sports either on their platform or by logging in to channel apps. Plus, there’s Netflix and Amazon Prime TV. Our current set up is Plastation Vue Core Package, Netflix, and Amazon Prime. All for less than $80 a month. That’s a $1,000 savings! Bottled Water – If you drink the recommended eight glasses of water a day and use plastic bottles, it will cost you roughly $1400 a year. There are many choices that take up less space and cost way less. You can buy a great glass bottle like the ones we have. If your water isn’t consumable or you’re concerned with chlorine and other chemicals, consider purchasing a counter-top water filter. Another great option is a simple water pitcher filter system like this one. A House – I know it is extreme and it isn’t for everyone. But I feel it is important to mention that not everyone needs a big ‘ole home with a picket fence and a two-car garage. I grew up in an apartment and later a mobile home. All I wanted was to be “normal” and live in a “real” house like all of my friends. I laugh at the irony that we are not about as abnormal as you can get. Where is God calling you? It might not include your 1600 square foot cape cod. Old Email – Ah the digital age! Digital clutter consumes space and time and even money if you’re paying for cloud storage. When is the last time you decluttered your inbox and storage drive? Save off old email, archive or file it to keep your inbox clean. Takeout Menus – Most restaurants have their menus online and every Chinese place has the same thing. Ditch ’em and save yourself the space. Cosmetics & Toiletries – How many travel shampoos do you have from hotels? You don’t need them. Donate them to your local homeless shelter or use them in Operation Christmas Child shoe boxes. 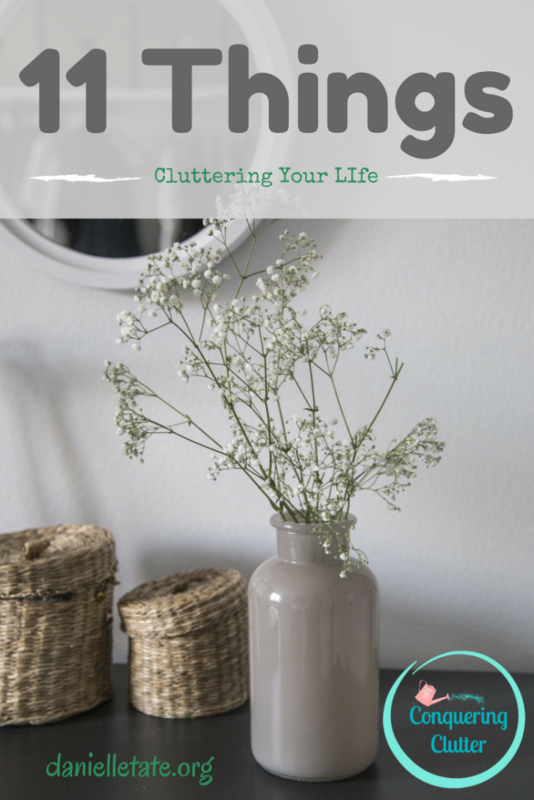 There are many ways to reduce clutter in your home and get rid of things you don’t need. Start by looking at things with a critical eye and ask the Lord what things you are holding on to that are unnecessary. What things can you add to this list?